Snow-by-Night levels a threat at Pieter. Or is it a promise? Pieter treats it like a promise, but he’s a glass half-full kinda guy. It’s now time to get to what you’ve all been waiting for — experimentation! Pieter begins his observations, but he’s got a curious onlooker who is interested in everything he’s going. 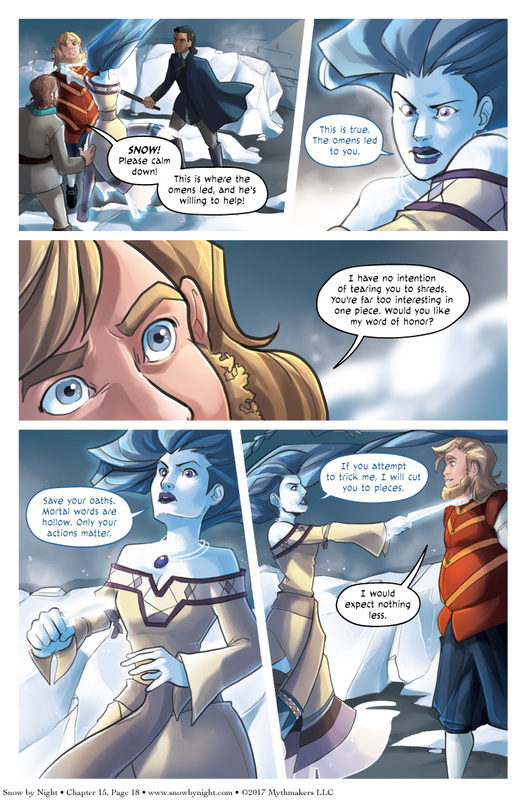 See for yourself when you vote for Snow by Night on Top Web Comics! I have some more announcements for future conventions. We’ll be attending Nekocon and and Indigenous Comic Con in November. We’re also attending Ring of Fire next March. More on that later. AwesomeCon is this weekend! Our biggest new feature is a line of Sailor Scouts prints from Amanda Gomes. We’re big magical girl fans and we reimagined them in 18th century naval garb. The Inner Senshi are in naval uniforms while the wild Outer Senshi are dressed as buccaneers. They look fantastic. Thank you, Amanda! Experimentation? To start, please sit on this chair inside this alchemical circle… why are you looking at me like that?